This is the most highly specified Westcoaster hull to leave the factory in WA. Built to survey for an increbily discerning owner in 2000, every facet of this vessel was built to a remarkable standard. Mark Ellis penned this custom design to his particular requests and the final results are outstanding. A true bluewater cruiser, this vessel has been as far as Indonesia and circumnavigated Australia twice. The current owner is just the second, purchasing it in 2008 off the original owner with just 450 hours showing on the clock. Since then she has been continuously maintained by the full time skipper and trained shipwright, with a full respray being completed in 2018. Whilst the vessel was being resprayed, all decks were relaid with beautiful 19mm teak. When stepping aboard "Georgia" you instantly notice the sheer amount of outdoor living space available, a trademark of West Australian design. The lower deck boats a sizable sun lounge, cocktail bar with fridges and icemaker, day head and TV. A laundrette is hidden from view behind the bar, housing a Miele Professional washer and separate dryer. Moving forwards through the electronically actuated sliding saloon door, the galley and classically furnished lounge and dining area await. The saloon's classic design is timeless and will never feel dated. The large chef's galley is located right near the aft door and dining table, meaning no mess is transported throughout the vessel to the dining areas. It features one of two walk-in cool rooms on the vessel, European appliances, commercial grade oven, gas and electric hotplates, dishwasher, microwave and huge pantry. The second walk in cool room is located near the forward deck hatch, which is also switchable to a freezer. Moving down to the accommodation: A forward V configuration crew quarters sleeps 4 comfortably. Two opposing double bunk cabins to port and starboard, each with their own en-suite. Further aft, a full beam master cabin. The king bed has acres of space around either side, with built in robes, a desk, entertainment unit and huge en-suite, this cabin truly rivals some apartments for size. The forward helm position gives the skipper a clear view of their bearing, aided by a commercial-grade array of navigation equipment. The wheelhouse also houses a fold-out sofa, office work station and quality bar fridge. The upper deck has a 1 tonne davit and tender to the aft section, with an external galley and Zanussi commercial-grade stainless steel BBQ station towards the wheelhouse end. Even with the tender occupying its cradle up on deck, there is a huge amount of usable space left for entertaining. Access to the engine room is gained through the stern swing door. A pair of MTU 2000 series 1350HP V12's provide economical long range cruising at 12 knots. If there is adverse weather to dodge, she will manage a comfortable 17-18 knots dependent on load. Twin generators power the vessel's systems however there is hardly an instance where both are required. The primary walk in freezer is located below deck in the well-appointed workshop area. There are numerous spares that come with the sale of the vessel, too many to list. A spare gearbox will also come with the vessel. As you can appreciate, there is simply too much to list here for this unique and desirable vessel. If you are looking for a true bluewater cruiser that will eat up the miles in comfort then you simply cannot discount Georgia. Move quickly and make the most of the peak season in the Kimberley region and northern WA. 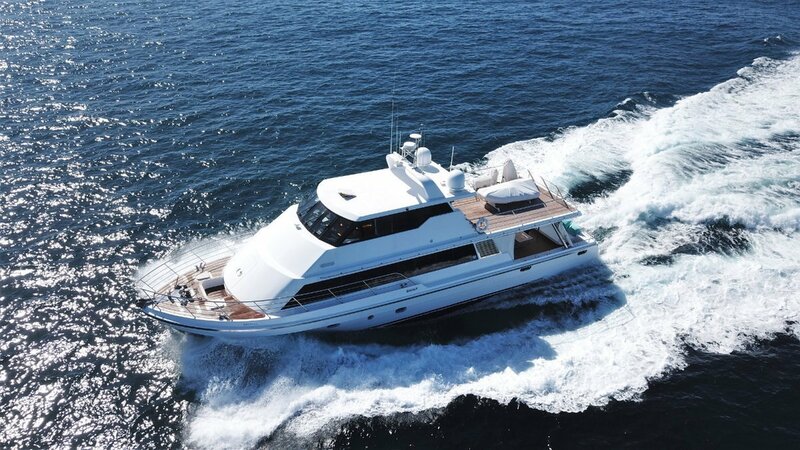 For further details including comprehensive specifications and high resolution images, please contact Tom Lovelady, Matt Lovelady or Brad Arnup at Oceaneer Marine Brokers. +61 (08) 9243 6373. Alternatively email: sales@oceaneermarine. Com. Au. Air ConditioningRefrigerative A/C ducted throughout. Reverse cycle in cabins.